Doctor Aphra #24 is a time of escapes, but it’s also a time for everything to get worse for Aphra. She tries to save her friends, but when it comes time to save herself, she comes up a little short. Scoring riches isn’t easy, and her past is finally catching up with her. Again. Plan A is to get everyone on an escape pod and blast them to safely. Well, not everyone. Aphra still has to steal a lightsaber from a Force infused spore creature. But Plan A doesn’t go as planned because Tolvan jumps ship to stay with Aphra. Plan B – Aphra lures in the bounty hunter Tam Posla with the promise of Dr. Evazan. This is where Lopset comes in. Tam takes the bait, and Lopset, and leaves Aphra with a shuttle so she can escape. Aphra also uses Tam as a lure to trap and freeze the deadly hookspore. This opens the way for her to steal the lightsaber. But that’s when her plan starts to fall apart. Triple Zero and BT show up. Then Tolzan’s Plan C comes into effect. The arrival of Vader causes Aphra to lose hope. But she does come up with one more plan. Plan D – use the Bor to wipe her mind so she won’t remember anything. Now that is quite the evolving storyline. Lots of twists, lots of characters, and still lots of room for conflict. Triple Zero and BT are still on the hunt for her, she’ll have to talk Vader down after she wipes her mind, and she’s gotta figure a way out for Tolvan. We’ll have to wait to see how that all goes down in the next issue, but it certainly generate interest. Aside from the story, the artwork is pretty good. It’s not my favorite, as Tolvan has definitely looked better in the hands of previous artists, but there are some really good visual moments in the issue. The one’s with Triple Zero have a nice, scary, epic quality to them. And Vader’s arrival also captures that emotional impact. Plus the cover is pretty awesome looking too. 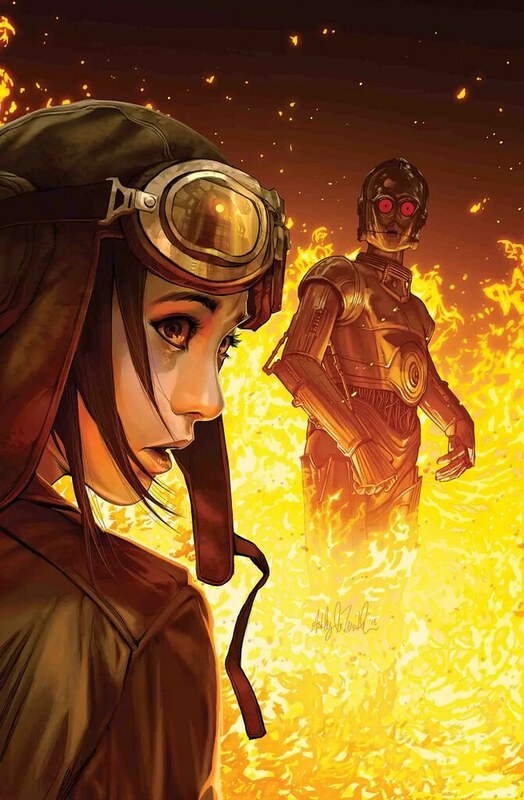 With good artwork and a good story, Doctor Aphra #24 lays out an enjoyable story, even though its very much a cliff hanger for the next issue. I give it a four out of five metal bikinis.